Back in the 90s I enrolled in a writing course at the CAE. Confusion Anxiety and Entropy. No, sorry. That was me in the 80s. The course was with the Council of Adult Education and it was in the city one evening each week. 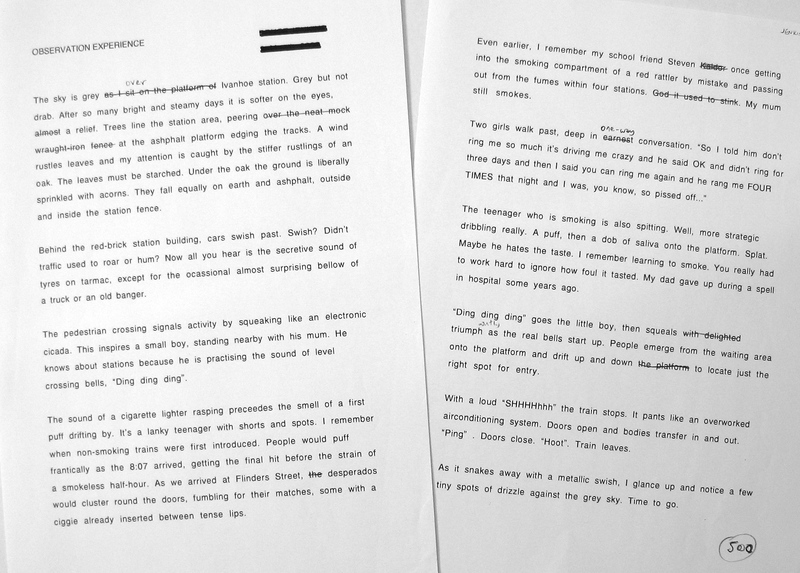 I completed ‘Writing for the Stage’, and I finished ‘Writing Fiction’. Neither of those produced anything of any merit whatsoever. The subject where I felt most at home was ‘Non-fiction’. Taught by an aging nicotine-stained hack whose world-weariness oozed forth in numbing waves, he seemed most engaged by trying to edge his feedback as close to cruelty as could be managed without eliciting more than one heads-down snuffling response each class. This made the mandatory out-loud reading of work a rather fraught experience. Although I would have been either cringing under the desk or rushing out for urgent toilet breaks if it was my fiction or theatre writing being shared, in the non-fiction arena I felt curiously at ease. Guess all those years of psychology essays strengthened my non-fiction backbone. For one homework exercise we were required to choose a location and observe, then write 500 words describing what we saw. I went to Ivanhoe railway station with my notebook and pencil. In fact I went twice, so as to get extra material. Cheating? Probably. Anyway, I was reasonably happy with the piece I wrote and when called upon to do so, I felt calm and slightly curious. How would my observation piece be received? I delivered the piece in a flat voice, a trick learned via Drama and reading poetry out loud. It’s not colour or emotion that recitation needs, in fact they detract from the material. What works best is unadorned presentation of the words. Though timing helps. When I got to the end, I looked up. Mr Unkempt stared at me. I stared back. Not defiant nor provocative, just waiting. ‘Next!’ he barked, and looked away. It was one of the best bits of feedback I never received. So we arrive at the point, and soon the music. After a few more pieces had been presented and dismantled with bored efficiency, Mr Unkempt set us a most interesting task. Mangle these carefully constructed sentences? Excise excess verbiage? Delete my flowing prose? Outrageous! But you know what? It worked. The final piece was tighter, leaner, more focussed. Better. Someone said about jazz that it’s not what you play but what you leave out that counts. Whoever said it, Mark Hollis heard and obeyed. The progression of his 80s band Talk Talk from earnest synth-pop New Wavers to post-rock Impressionists was one of diminishing commercial returns but blossoming musical sophistication and lyrical intensity. It is a fascinating catalogue where each album both builds on and departs from its predecessor. One notable arc is the increasing space that permeates the music. It’s an almost magical process of reduction and distillation where the experience intensifies as more is taken out. Yet in final album Laughing Stock (1991) there is a radiance, a shimmering beauty that belies the sparseness, the emptiness of the arrangements. 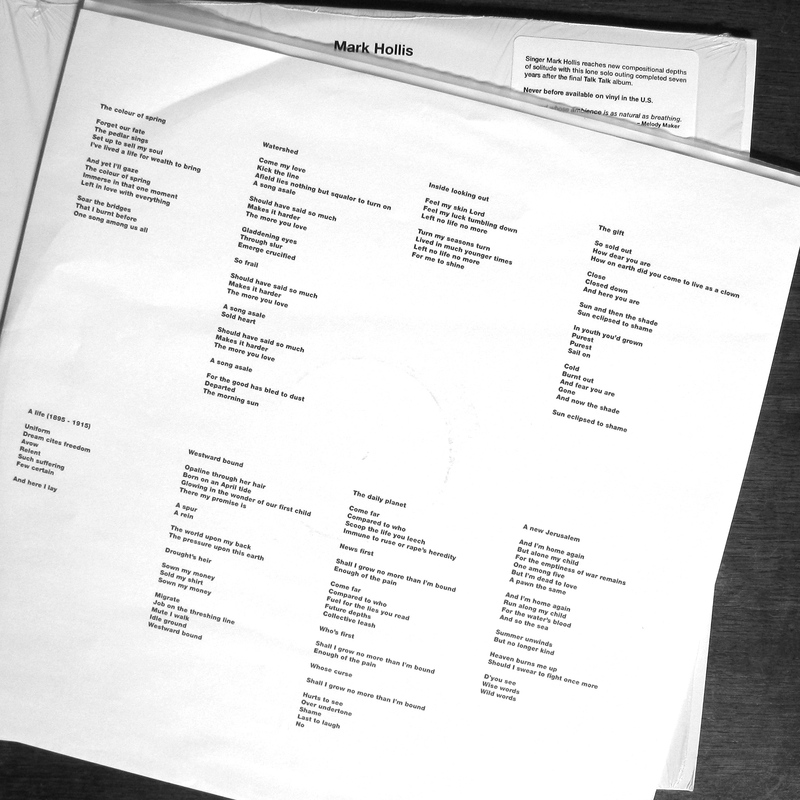 Then in 1998, a solo album called Mark Hollis. Fittingly, the first 20 seconds are silence. It’s an invitation, a challenge; here is a work of skeletal beauty and insubstantial intensity. Like a sculptor liberating a kinetic form from inert rock, so Hollis has clinically, lovingly, painstakingly taken away all but essence. It is ambient like a mist wrapped dawn. It’s jazz like a perfect Miles phrase, folk like a crystal Pentangle refrain. Yet there are no choruses here. Just the Hollis voice: always tentative, sometimes whispering. Shy in aspect but breathtaking in its human vulnerability. The songwords are intrinsic to the whole; they too have been interrogated individually to ensure each carries weight and moment. This is not an album to dissect track by track. It is a work to cherish, to embrace, to release into a dimly lit room where its lambent cadence will tighten your chest and pierce your heart. At end, it will leave you quiet; humanity crumbled in wise, respectful hands and leavened with an anguish that renews. The colour of Spring, the smell of baking bread. 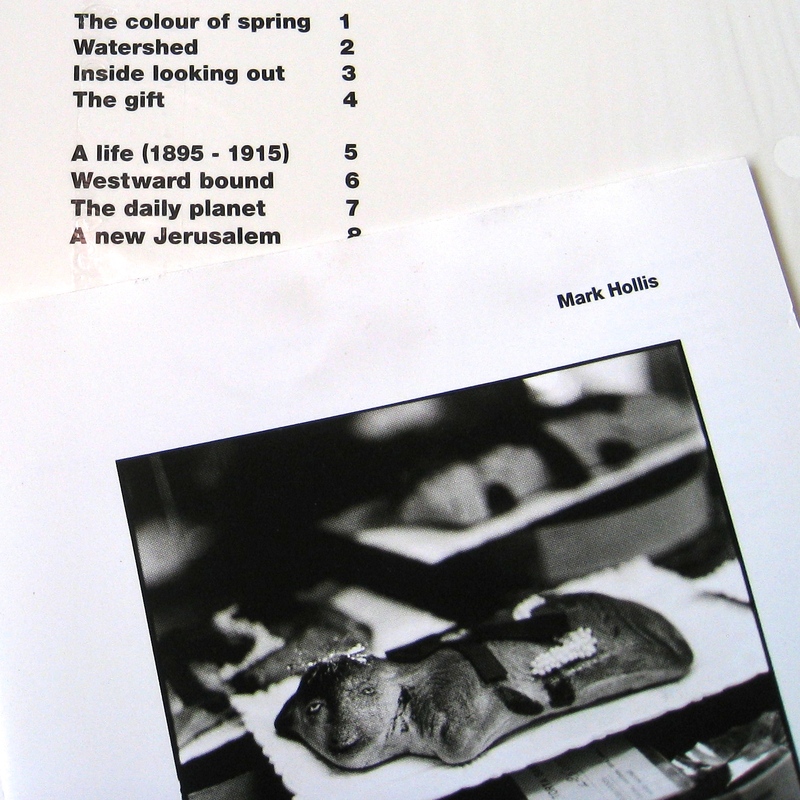 For a companion piece, Rob Jones has written on Mark Hollis at The Delete Bin. Here is an album where I turn to the CD over the vinyl. It does not lend itself to surface noise. I was nevertheless overjoyed to acquire the vinyl not long ago, prompting this rather gushing post. I’m a big believer in the value of the notes that aren’t played – I enjoyed the ‘strategic dribbling’ line from the piece! Yes, me too. Though a barrage of noise can be just the right assault sometimes as well! Thanks for burrowing down to the ‘creative writing’ piece! I look forward to listening to Mark Hollis. Prejudicial bells are ringing; perhaps a word later. I’d love to hear this one. I’ve only got a handful of Talk Talk albums but they are sublime. I enjoy them very, very much! Yep, Talk Talk are very special indeed. If you like the last two TT albums, and the minimalist direction Hollis was heading, you’ll surely enjoy his solo album. I don’t know much about music in the 80s and have never hear of Talk Talk, but think I will check out both Mark Hollis and TT. I, too, have always found non-fiction writing much easier and more comfortable for me also. I think you are a wonderful writer. One idea is to start with an artist’s most successful material – these were the works that connected with the most people. For Talk Talk, that would be the album The Colour of Spring. Here’s a link to a song I like very much. If you do too, well, you’re on your way! Thank you for the info. I’m going to check them out today. I’m always looking for new music! “This is not an album to dissect track by track. It is a work to cherish, to embrace, to release into a dimly lit room where its lambent cadence will tighten your chest and pierce your heart. At end, it will leave you quiet; humanity crumbled in wise, respectful hands and leavened with an anguish that renews. The colour of Spring, the smell of baking bread”. Thanks J. Really, there are not a huge number of album sufficiently magical to have me reaching for my tatty paper bag of poetic phrases, so I’m delighted you enjoyed the piece. You’ll surely enjoy the album a whole lot more. Nice one Bruce. Your tales of writing class made me smile, reminded me in fact of David Sedaris story ‘Me talk pretty some day’ which can only be a very good thing. Spirit of Eden is a wonderful, wonderful LP, but that’s as far as I’ve explored to date. You may just have sold Mark Hollis another one. I know you are a man of many musical parts, but can easily imagine that in a suitable mood – after a ramble on the Welsh moors with your beloved when you slightly sprain your ankle soon after setting out but keep going anyway, for instance – you would find yourself misty eyed over this album. Wear sturdy boots, though. You leave my musical parts out of this! Listening to such an album makes me want to improve my listening style – it deserves attention that I don’t give it when doing other stuff on the computer. (See! I just burnt a finger rushing to rescue my pecan molasses cake from the oven due to loosing track of time). 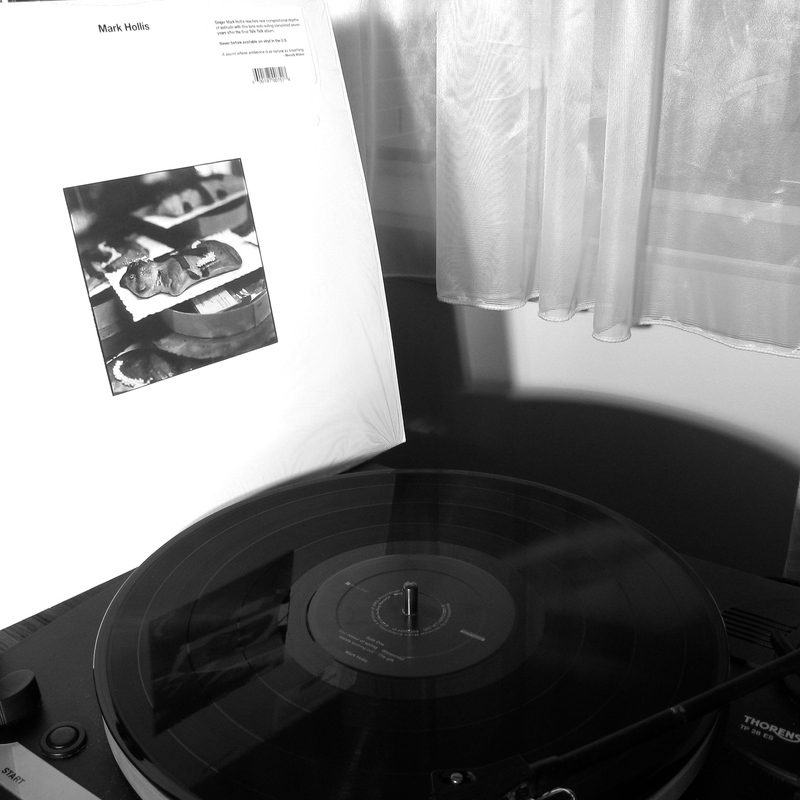 Subtle yet blatant – words that should not go together came to mind as I listened to Mark Hollis (NB: without the negative connotation of blatant). Using silence seemed pretentious to me before listening but that prejudice is dispelled. I enjoyed the writing and the alum, thank you. Always delighted to help dispel prejudice! I think one of the reasons this works is that there is such care and craft in the minimalism. It is artistic choice rather than artifice. So glad you enjoyed Mark Hollis and that your attention was rewarded (bar the finger burning). That is an intriguing (and slightly disturbing) concept.